Farmers Market starts July 10th! I will be doing some great deals! "No matter how you feel, get up, dress up, show up!" I graduated from the Ogden Weber Applied Technology College on July 2nd 2008 with my Nail Technician License and I have been doing nails ever since. I am very passionate about my work; I love helping my clients feel as happy and pretty as possible. Staying trained and learning new techniques and challenging myself each day to better myself is very important to me. 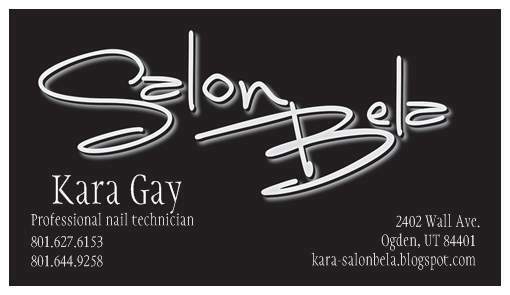 Being part of the Salon Bela team since March 2010 has been an amazing opportunity I couldn't ask for more! Salon Bela's vision is to bring an exclusive, inviting, high end salon to the beautiful, Historic street of Ogden. Salon Bela is a quaint, full service salon. That offers high end results and customer service. We are passionate in all that we do and offer all the lastest styles and techniques. Our goal is to bring out that inner beauty in all of us.